I absolutely love Castles of Mad King Ludwig. It’s one of my top favorite games on my shelf. I think the game is well-designed, from the room pieces to the mechanics. The game has almost endless replay value, and it is very simple to explain. Each player is trying to build their own castle and score the most victory points. Each round the player who is the master builder will draw cards that tell them what kinds of rooms they need to put out for sale. The master builder sets all the prices of the rooms, but then gets to buy a room last. Rooms vary from 100 sq. ft. to 600 sq. ft., and there are 8 different kinds of rooms, activity, outdoor, utility, etc. When you place a room in your castle, you score points based on what you put that room next to. Each room has a base victory point value, but they will also have a bonus point value that you will score if you meet the criteria. For instance, there’s a room that will score you 3 extra points if you connect it to the doorway of either an activity room or a utility room. Now all those rooms will also give you a completion reward if you manage to successfully match up all of the doorways with other doorways. Those rewards could be something like re-score the completed room, take an extra turn, get 10,000 mark coins, or take another bonus card. At the beginning of the game, each player will get 2 bonus cards. These will give you extra points at the end of the game. Some examples: 2 extra points for each 250 sq. ft. room in your castle, 1 extra point for each round room, 2 points for each outdoor room, and so on. There are also public end game scoring objectives. They are similar to the bonus cards, except they look for the person with the most of a type of room or square footage of a room, etc. The person who wins the objective gets the most points, the second place person gets less points, and so on. The point values and the amount of end game objectives change based on the player count. One of the major things I like about Castles of Mad King Ludwig is that there are so many avenues to victory. But even with all of that variety, the game is pretty easy to explain. It rarely takes me more than 10-15 minutes to explain this game, and within a turn or two, new players are getting into the grove of picking rooms and attempting to maximize the benefits of completing a room. The variety in the game is fabulous as well. Every single room is different, from the name of the room (I personally like the nap room and the fungus room, I mean who wouldn’t want those rooms in their castle?) to the points that they score. Reading off the different names of the rooms and looking at the overall ridiculous castle you build is part of the fun. 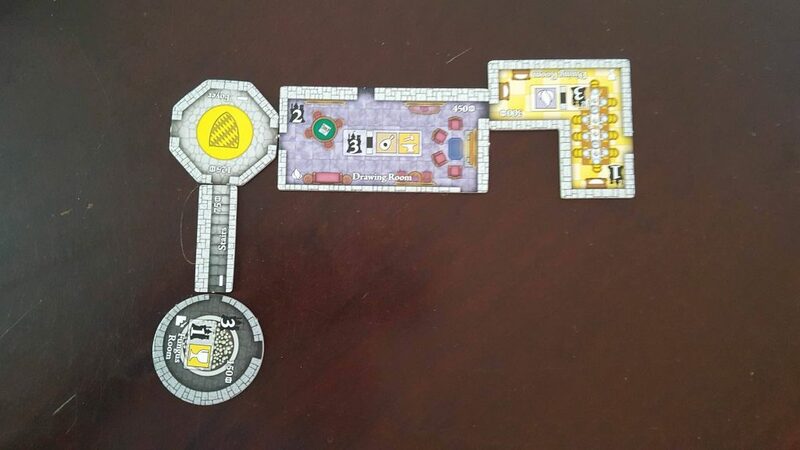 Another great thing about Castles of Mad King Ludwig is that you will never play the same game twice, because when you start the game, you do not play with every single room tile. Depending on the player count, you only play with that many rooms, and it’s completely random. So some games, only one or two 150 sq. ft. rooms came out, whereas in another game all of them were drawn. Normally I don’t like games that have a ton of chance that’s involved. But while there is a bit of chance in what rooms are available for purchase, with some good planning and a flexible strategy, anyone can win the game. You can attempt to try to simply maximize the amount of points of each room you put down. Or you can try to go straight for those public objectives. Or you can try to complete as many utility rooms as possible to grab up more bonus cards to get more points at the end of the game. Besides that kind of large scale strategy, there’s a lot of intricate planning and scheming you can do as well. Not every type of room (utility, entertainment, etc) is available in each size. For instance, the 500 sq. ft. rooms can only possibly be the entertainment, downstairs, and outdoor types of rooms. So if you have a bonus card that gives you extra points for gardens, you can attempt to complete a sleep room, which gives you the bonus of taking up to 2 rooms from a stack of rooms, and put them in the queue to be drawn next. If you’re looking for gardens, you would want to choose two rooms from a size that possibly has gardens. 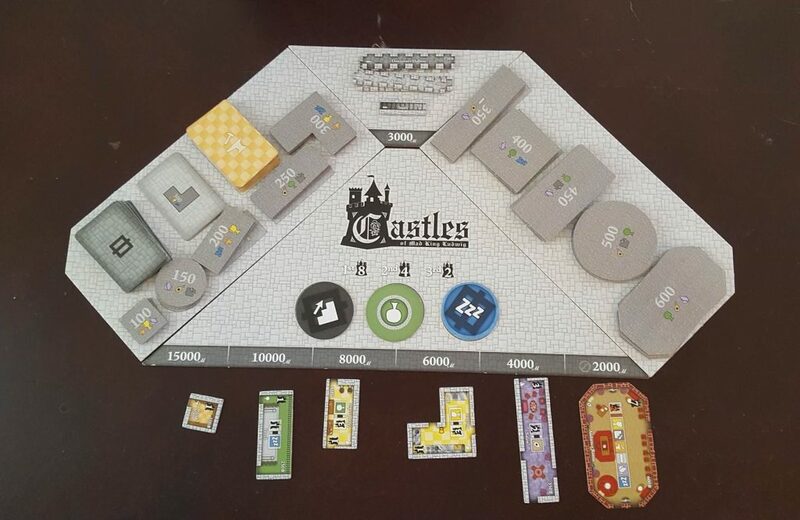 But despite having a deep level of possible strategies, the mechanics of Castles of Mad King Ludwig are overall very simple. The game never gets bogged down by complicated, nitpicky rules, which helps the game play smoothly and quickly. 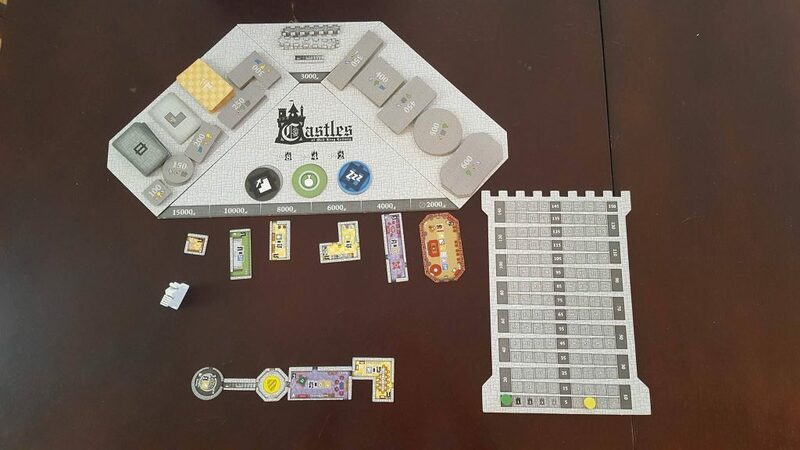 Castles of Mad King Ludwig has simple mechanics and a depth of strategy, great replay value thanks to some randomization of what rooms are available to purchase each game, and is super fun. I could play this game over and over again and not get sick of it. 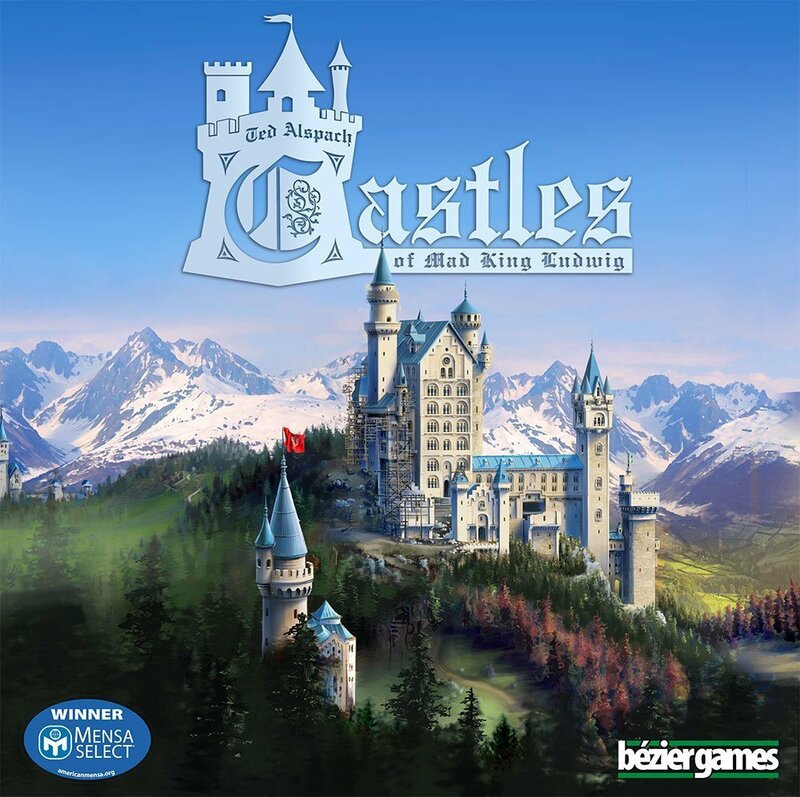 Castles of Mad King Ludwig is designed by Ted Alspach and published by Bezier Games. The game takes about an hour and a half to play, is for 1-4 players, and retails for $59.95 (though you can definitely find it for cheaper).